What causes hair loss? Can we prevent it? Reduce the effects? We asked an expert with 20 years of experience helping patients with this challenge. In partnership with Women&apos;s Rogaine • If any of you lovelies has noticed you have less hair than you used to, are worried about how skinny your ponytail has become, and/or are freaked that something is terribly amiss, I&apos;ve got some solid information and advice from someone who truly understands how you&apos;re feeling, and who knows a lot about the subject. I&apos;ve also already touched on the subject of Women&apos;s Rogaine and its key ingredient, minoxidil (click here for "Kelly&apos;s" story); we&apos;re going to get more into detail about that here, too. "Hair loss terrifies women. It&apos;s devastating. They think there&apos;s something wrong at a metabolic level," says Dr. Charlene Linzon. A dermatologist, Dr. Linzon has been the director of the University of Toronto Hair Loss Clinic at Women&apos;s College Hospital for 20 years. "Generally speaking, it&apos;s actually hereditary hair loss." The result of a genetic combination inherited from our maternal or paternal side or both, a predisposition for hair loss is a really common reason for thinning hair. Dr. Linzon says more than one in four women will have to cope with it during her lifetime, and as many of 40 percent of us will exhibit varying signs of it by the time we reach our 50s. As well, "certain lifestyle factors that cause stress can have an impact on your hair&apos;s thickness, and bring hereditary hair loss on earlier," she notes. "Some experts believe thyroid condition, hormonal imbalance and Vitamin D deficiency may also contribute to hair loss. It&apos;s been shown that low iron can precipitate hair loss, but it doesn&apos;t help when we fix a patient&apos;s iron levels." I know none of this is particularly reassuring if you&apos;re already fretting about the volume of hair that screams at you from your shower-stall floor. But here Dr. Linzon explains the mechanics of thinning hair and tells us what we can do to combat it. In terms of hereditary hair loss, what&apos;s happening biologically? Everyone is born with about 100,000 hair follicles on the scalp. Hair is either growing or falling. Once hair has decided to fall out – that&apos;s the telogen stage, and it&apos;s always 2 to 3 months long – then it does. There&apos;s not much you can do about it. But then it comes back in, and that hair will stay in the growing or anagen phase for 3 to 6 years. As well, the new hair that regrows is miniaturized. Gradually, thinner, light-coloured hairs called “vellus” hairs will replace thick, darker hairs; that manifests as hair thinning. What does hereditary hair loss look like? Are there specific characteristics? Men’s hair tends to recede at the hairline and/or they experience hair loss around the crown of the head. A woman’s hair loss usually doesn’t involve recession of the frontal hair line. Instead, it&apos;s a more dispersed thinning on the top of the head. The Savin Scale of female hereditary hair loss (via the American Hair Loss Association). 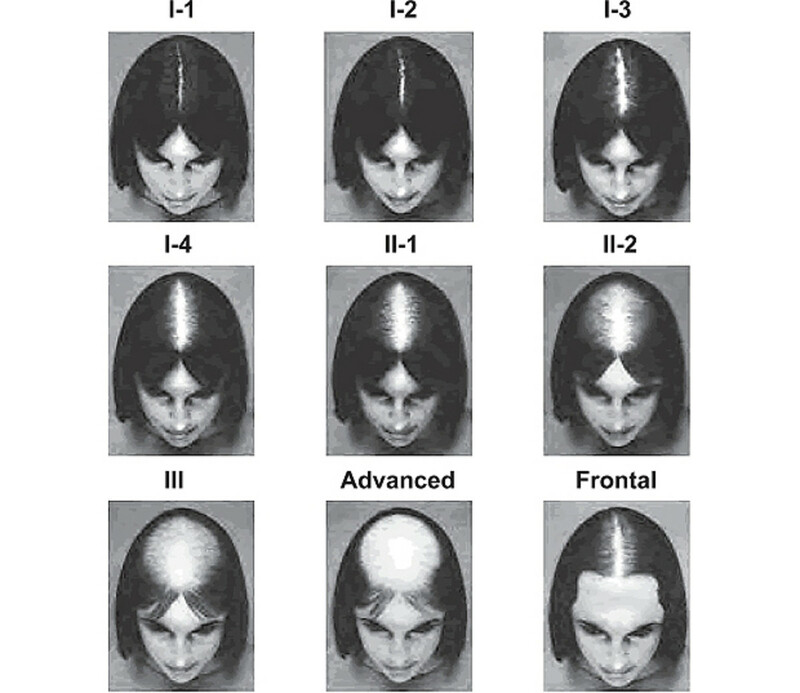 Also known as female pattern baldness, hereditary hair loss in women typically follows a specific blueprint. We experience a general thinning of the hair, with the most extensive hair loss occurring with the widening of the central part in a “Christmas tree” pattern. I have a friend who has been experiencing some thinning; she mentions it every once in a while. But is it something women really talk about much? My patients discuss the condition openly with me because I&apos;m a doctor that specializes in the condition, but I know that many people are usually very embarrassed to discuss because it is very personal and emotional. I&apos;m their last stop in dealing with it. I would say women tend to bring up the condition elsewhere first, usually with their hairdresser. Can hereditary hair loss be prevented? Without gene therapy, hereditary hair loss cannot be prevented. If someone has a strong family history of hair loss and notices thinning, she should treat the condition as early as possible. If you’re able to catch the condition early on when it’s mild, you’re likely to keep the thickness of the hair and the thinning may not be as noticeable. 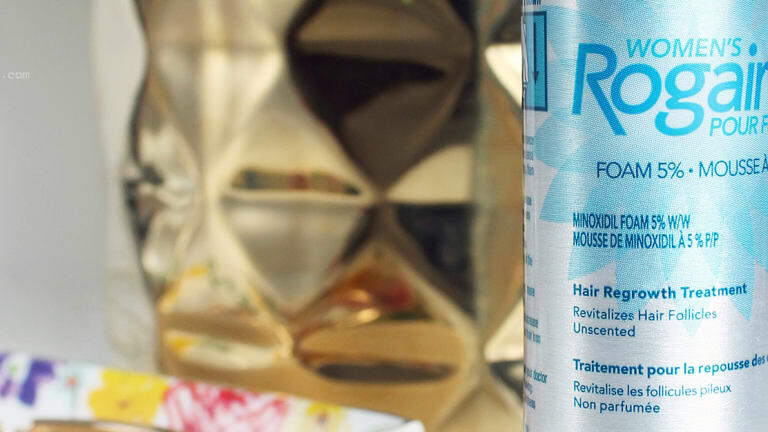 If you caught this earlier post about thinning hair, you know that my friend Kelly found Women&apos;s Rogaine Foam really helpful in her experience. As you&apos;ll see almost immediately as you read on, Dr. Linzon herself is no stranger to Women&apos;s Rogaine and its key ingredient minoxidil. Okay, let&apos;s talk about minoxidil-slash-Women&apos;s Rogaine. How does it rate for you as a treatment or management option? It&apos;s my first recommendation: use a topical minoxidil treatment such as Women’s Rogaine. I love Rogaine; I&apos;ve used it. It works. Androgenetic alopecia shortens the time that hair spends actively growing – the anagen phase – and it shrinks the hair follicles. Minoxidil stimulates the follicle, keeping hair in the anagen phase longer, and delays shedding. This allows the hair to grow thicker, and prevents new hair from growing in miniaturized. You can see why it&apos;s important to start early and preserve the thickness of the hair – you&apos;re working with more hair follicles. It becomes prevention as well as maintenance. I start people on Rogaine when they&apos;re young. I have five kids, and all five are on it – I put them on it when they were about 16. Women’s Rogaine is currently the only hair regrowth treatment with minoxidil specifically authorized by Health Canada to treat female hereditary hair loss in Canada. Beyond minoxidil, there is no scientific evidence to support that other treatments, vitamins or shampoos alone help regrow hair. 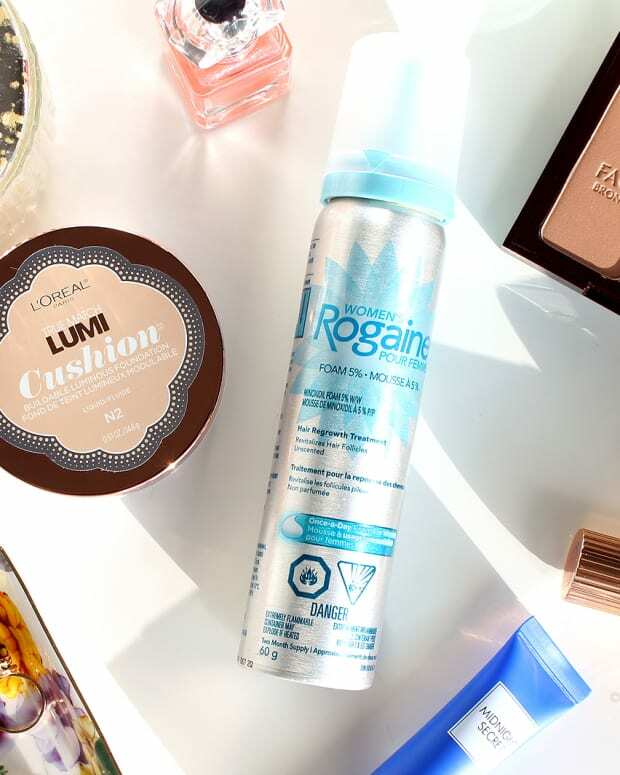 Women&apos;s Rogaine is a foam – why that format instead of a solution? Men&apos;s Rogaine is a solution, isn&apos;t it? Foam is also easy to insert into your daily beauty routine: apply it after you&apos;ve washed your hair, or put it on before bed and shampoo in the morning. Please note, though, that you should not shampoo immediately after applying the foam – it’s best to wait about four hours. Is there anything else you recommend for women coping with hereditary hair loss? Do they have to avoid styling aids? No, women with hereditary hair loss don&apos;t have to avoid styling aids (products or heat styling tools are ok!) What they use should really depend on the type of hair they have. As an adjunct to minoxidil, though, I do recommend using an anti-inflammatory shampoo (like a anti-dandruff shampoo) but it must be used in addition to the minoxodil – it won&apos;t be helpful in hair regrowth as a standalone. Additionally, I recommend going to your family doctor for a work up to ensure that there is no other health condition affecting your hair loss. If your hair loss is a result of anemia or factors other than genetics, you should visit a doctor to get treated. I know, this was a long post, but there&apos;s so much important information to help allay fear and worry, and about minoxidil and Women&apos;s Rogaine Foam. For more on Women&apos;s Rogaine Foam, visit womensrogaine.ca. We&apos;re not finished with the subject of women and thinning hair, by the way. Our next move is to consult a hairstylist, often the first confidante when it comes to hair loss, according to Dr. Linzon. If you&apos;re coping with any form of hereditary hair loss, you must have questions you&apos;d ask a hairstylist who regularly sees clients experiencing a similar condition. We&apos;d love to pass on your questions; please do leave whatever you want to ask in the comments below. What do you think about all this so far? 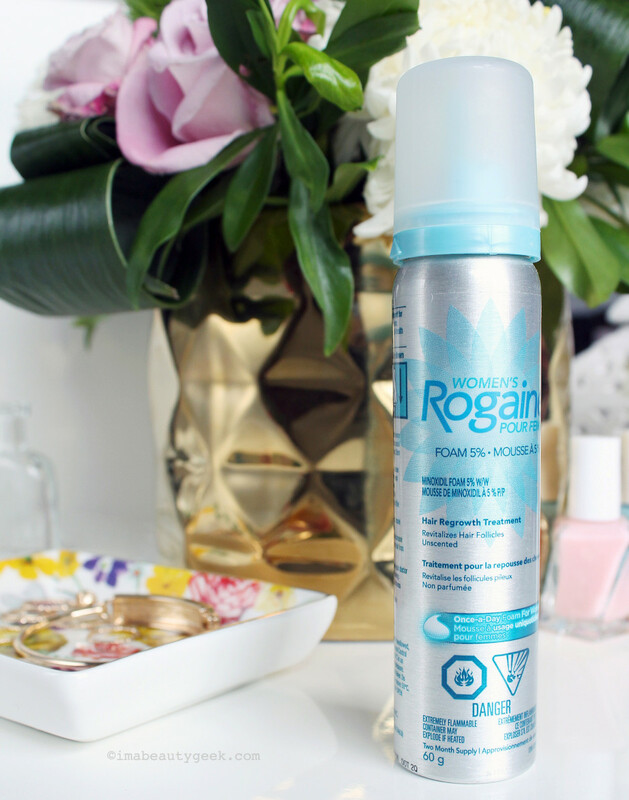 If you haven&apos;t tried Women&apos;s Rogaine Foam already, is it something you&apos;d consider?